will be released from Bandai Visual ! 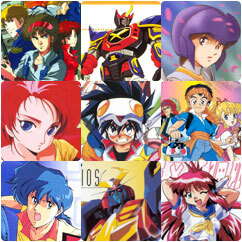 "Super Robot Wars Z" ! "Lamune & 40 Series Memorial Book" will be released ! Release From: Shinkigensha Co., Ltd.
"Dorvack" Figure release information ! "EM (Excellent Model) Alloy Powered Armor Dorvack Mass produced Caliber"
Release from: Art Storm Co., Ltd.
"EM (Excellent Model) Alloy Powered Armor Dorvack Mugen (unlimited) Caliber"
Tokyo International Anime Fair 2010 Special page open ! "Flower Witch Marybell" DVD release information ! Released from: King Record Co., Ltd.
"Dancouga" Figure Release information ! "Revoltec Yamaguchi Series No.78 Dancouga"
Release from: Kaiyodo Co., Ltd.
"Fairy Princess Minky Momo" Figure release information ! Release from: Lilics/ART STORM Co., Ltd.
You can now download "Fairy Princess Minky Momo", "Dancouga" and "NG Night Lamune & 40" from DSvision service ! "Powered Armor Dorvack" figures now available ! Figure: "Brave Alloy 21 Powered Armor Dorvack Combat Caliber"
Character products of "NG Knight Lamune & 40" will be out soon ! Powered Armor Dorvack figures on sale ! Figure: "Brave Alloy 21X VV-54A Caliber"
"Fairy Princess Minky Momo" 30th anniversary project announced at Tokyo International Anime Fair ! "Powered Armor Dorvack" Figures released ! Figure Name: "BRAVE Alloy 21 Combat Caliber"
"Fairy Princess Minky Momo" Accessories now on sale ! Name: "Fairy Princess Minky Momo *MOMO Heart Ribbon Earrings"
"Fairy Princess Minky Momo" Accessories on sale ! Name: "Fairy Princess Minky Momo *MOMO Heart Ribbon Ring"
Name: "Fairy Princess Minky Momo *MOMO Pendant"
Name: "Fairy Princess Minky Momo *Magical Princess Pendant"
Figures "Project Super Robot Series 005 Dancouga" will be released ! Released from: MOST WANTED LTD.
"Fairy Princess Minky Momo Blu-ray Disc BOX1" will be reseased ! Released From: Bandai Visual Co., Ltd.
Powered Armor Dorvack Figures now available ! Release From: Aoshima Bunka Kyozai Co., Ltd.
"Dancouga" Blu-ray Disc release information ! Blu-ray disc "Dancouga Blue-ray Disc Box1"
Release and Sold From: Bandai Visual Co., Ltd.
"NG Night Lamune & 40" Figures will be re-issued ! Figures of "NG Night Lamune & 40" will be released in January 2009 ! Figure name: "Variable Action NG Night Lamune & 40 Queen Sideron"
Now available in Hong Kong and Taiwan ! Figure Name: "Giant Vinyl series Goshogun"
We opened an online cel shop ! "Space Warrior Baldios" figures now available ! "NG Night Lamune & 40" figures will be released in October ! "Space Warrior Baldios" will join in that video game, Super Robot Wars ! Product Name: PS2 Game "Super Robot Wars"
Release From: Banpresto Co., Ltd.
Sold From: Namco Bandai Games Inc.
"NG Night Lamune & 40" DVD will be released on Sep. 26. Release From: King Record Co., Ltd.
"Dancouga" figures will be released. A "Dancouga Nova" book will be released ! A "Dancouga" book will be released ! More "Powered Armor Dorvack" figures will be released in May ! "Powered Armor Dorvack" figures are now available ! 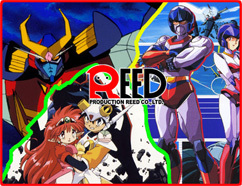 "Machine Robo - Revenge of Cronos" figures will be released in autumn 2008 ! Release From: Yamato Co., Ltd.
"Dancouga Nova" figures will be released in September 2008 ! "Space Warrior Baldios" figures will be released in autumn 2008 ! "Dancouga Nova" figures will be released in June 2008 ! "Dancouga Nova" figures will be released in May 2008 ! "Dancouga Nova" figures are now available in stores ! "Dancouga" figures will be released in July 2008 ! Figure Name: "GN-U (DOU) #4 Dancouga"
"Goshogun" figures will be released in July 2008 ! Figure name: "GN-U(DOU) #4 Goshogun"
Limited edition DVD will be sold at "Tokyo International Anime Fair".